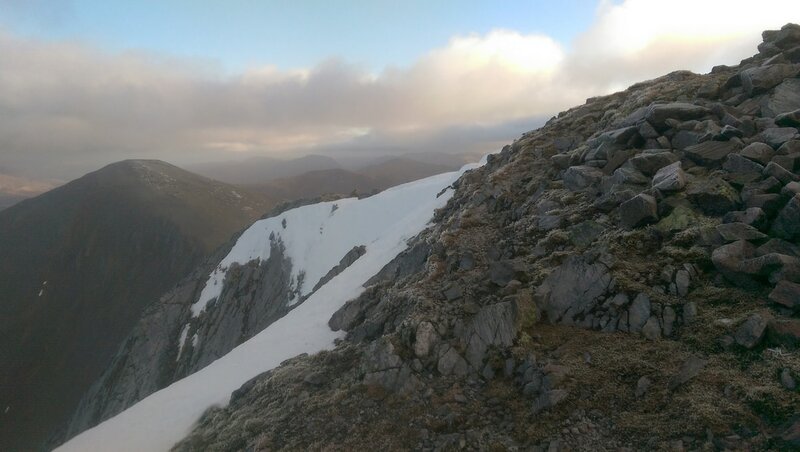 Banner photo: Stob Coire Easain left, the Grey Corries, with Sgurr Innse and Cruach Innse right. After a wonderful evening in Lairig Leacach bothy in front of a warm fire and in good company, I was first up and first out in the morning. As the slight track had made progress easy the day before, I followed it to the bealach south of Sgurr Innse before heading towards Stob Choire Easain. It was great to have a view of my previous day's hills. 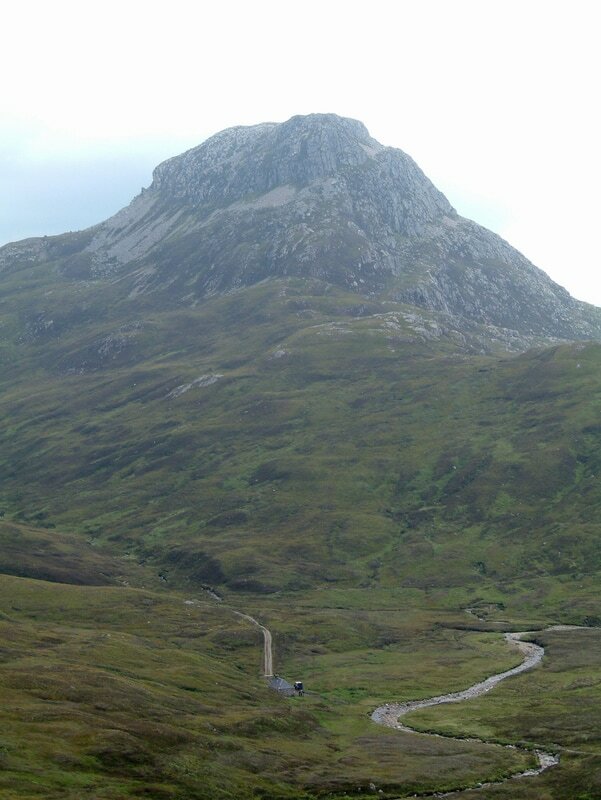 Above, Cruach Innse left with Sgurr Innse centre. 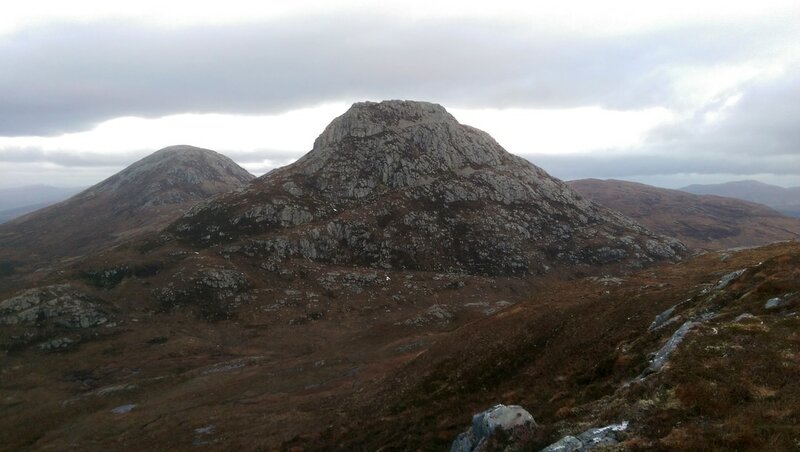 Cruach Innse is 48m higher but it is difficult not to think of Sgurr Innse as the main peak. It was also great to be able to survey the options ahead. 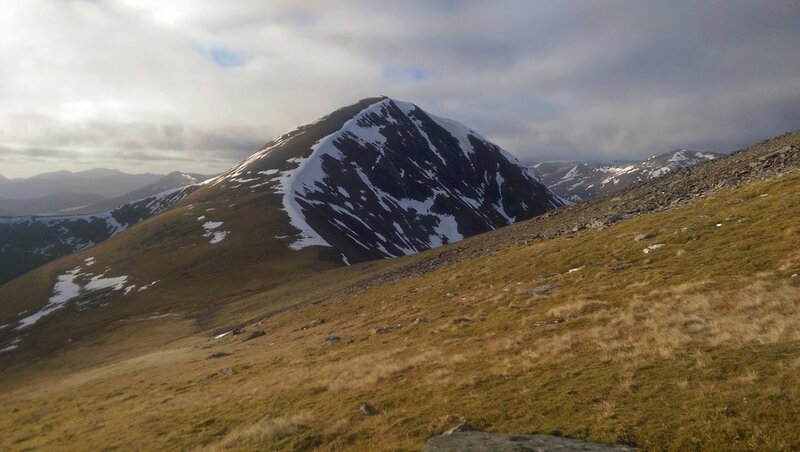 I opted to head towards Stob a'Choire Mheadhoin, seen in the photo below. This meant dropping to a lower point, but being a simple down and up, avoiding undulating terrain seen to the right, which I judged would have a greater total ascent. The walking was mostly easy, helped by the fact that any boggier bits were frozen. On reaching the steeper section, I followed a zig-zagging path to the summit. The picture below was taken just below the summit. Stob a'Choire Mheadhoin is the peak seen on the left. Below: Looking Sw down the ridge of Irlick Chaoile. Loch Treig left, the Mamores, Grey Corries and the Innses right. I positioned the phone among the rocks of the summit cairn and took a couple of selfies. Stob a'Choire Mheadhoin is the peak seen to the right of my left hand. The descent to the bealach between the two Easains was not totally straightforward as there were a couple of sections of hard snow. I could not kick very secure steps with the sides of my boots and at one point I opted to bum slide down, braking with my heels. 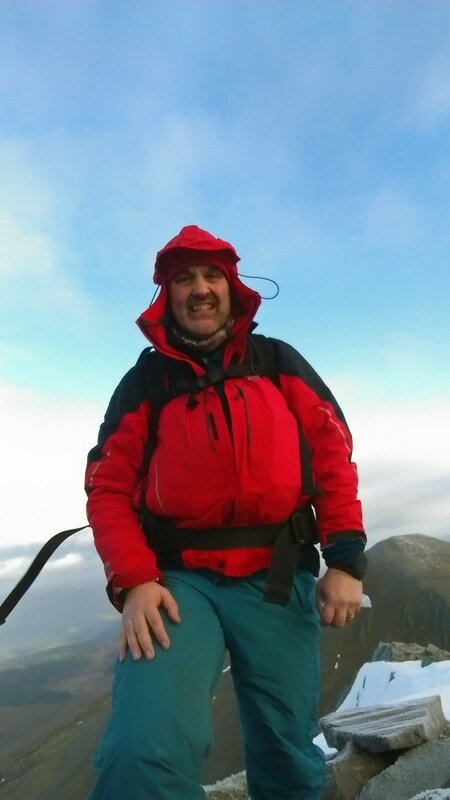 I had an ice-axe and crampons in my rucksack but I did not remove them. The slight difficulties could have been totally avoided by traversing the southern slopes away from the ridge. 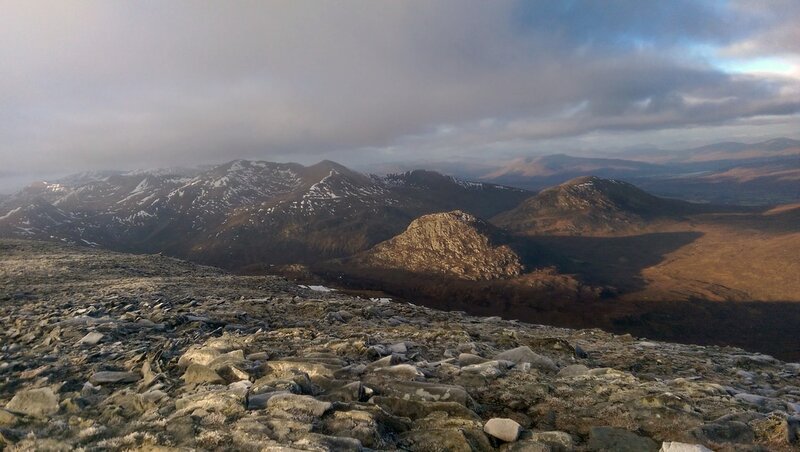 ​The continuation to Stob a'Choire Mheadhoin was totally straightforward. The wind was dropping and there was some slight warmth from the sun! Sgurr Innse bathed in the midday sunshine, though the sun was still low in the sky. 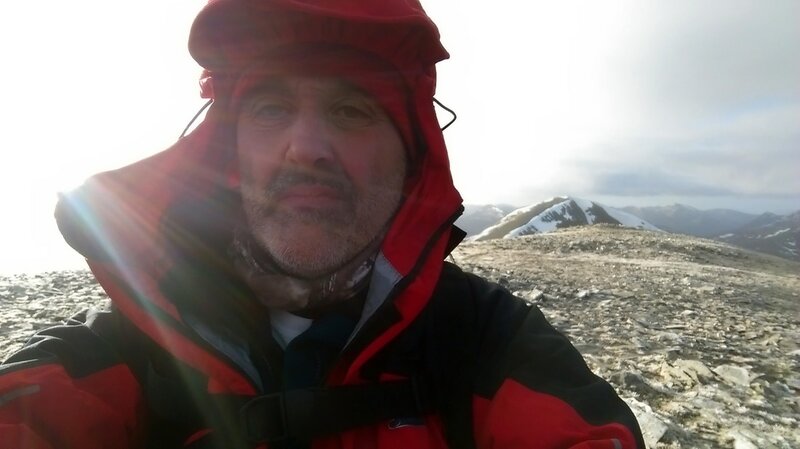 Summit selfie with Stob Coire Easain behind my left shoulder. 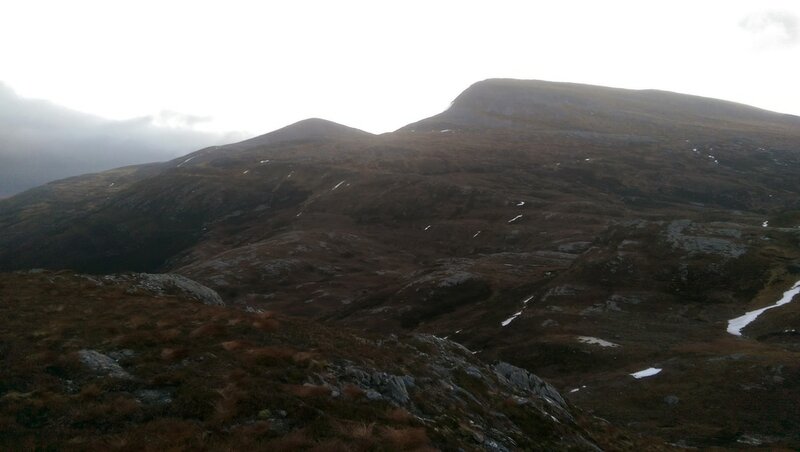 In stead of descending down the path to the bealach, I trotted down the grassy slopes to the south, heading for Moine na Gaibhre. My aim was to take the easiest and most direct line towards the path marked on the map following the east bank of the Allt na Lairig. 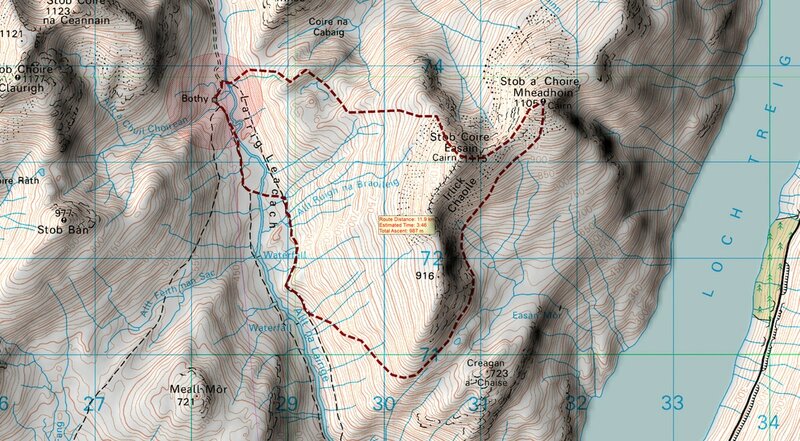 By the time I reached the Lairig Leacach, I was beginning to tire and the lack of a good path drained my reserves. The main problem was that I had not eaten much and though I stopped to eat, it was taking a little time for the carbohydrates to reach my blood stream. I was also a little dehydrated. ​On the opposite side of the Allt na Lairig, I saw an Argocat and wondered if he might have offered me a lift had I been on his side of the river. At that point, the Allt na Lairig seemed a bit too deep and a bit to fast to consider a crossing. With the Argocat long gone, I found a suitable crossing point, where, though knee deep, I could run across quickly enough to avoid the ingress of water through my overtrousers and gaiters. I could then join a much better path and I was now on the same side of the river as the bothy. The distance back still seemed greater than on the map. Psycologically, it would have helped if I could have seen the bothy much earlier but it does not come into view until almost there. Below: Lairig Leacach bothy with Cruach Innse beyond. Sgurr Innse is the fine peak right of centre. 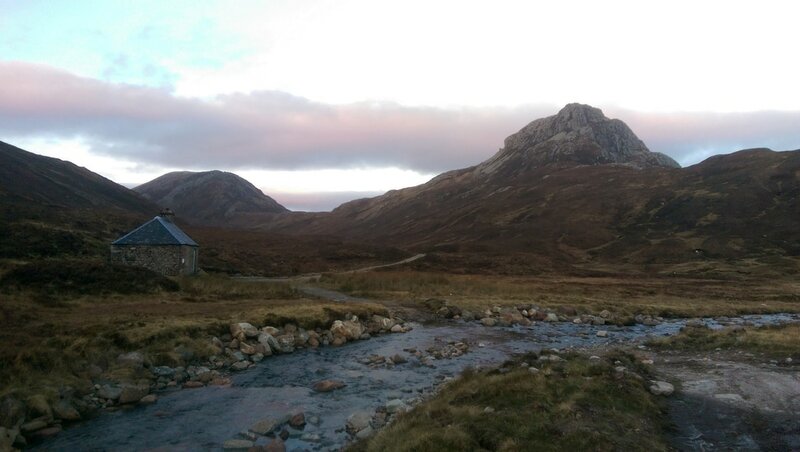 I spent my final night in the bothy as the sole occupant. I had very little fuel - a firelog left by the group of five lads, a couple of small pieces of wood that I had carried in and a couple of pieces of bogwood that I had collected. It was enough to make a small fire that lasted a couple of hours. The bothy had retained a little bit of the warmth created the previous night and I was dry, so a comfortable night was had. Getting up during the night for a pee was cold but great to spend a few minutes under a clear, starry sky. ​I woke up to a fine morning, though the sun was hidden behind the slopes of Stob Coire Easain. I tried to take a few photos, with some success but my phone kept on shutting down when I took a photo, presumably because of the cold. I would pop back in for a few minutes, warming up my phone in the internal pocket of my fleece jacket. In the morning, I was hoping to get a good shot of the bothy with an illuninated Sgurr Innse, but I gave up patience with the camera on my phone and I decided to head off. Waiting another 20 mins probably would have given me the picture that I was looking for. As I left, the strap of my helmet was caught up in the gear shift on my bike and while sorting it out, I pulled the gear lever and the rear brake locked. I pulled the calipers but something went in the process and the rear brake no longer operated. The front brake had not been working very well for some time and was insufficient to slow me down on steeper descents! I had been looking forward to a speedy return to my car, but I could not risk going at speeds where I could not brake with my feet! As a result I pushed my bike down the steeper sections. On reaching the "Wee Minister", I met two ladies, One of whom taught bike mechanics. She fiddled with the rear brake a bit and her efforts made a big difference but by then, I was almost at the car. 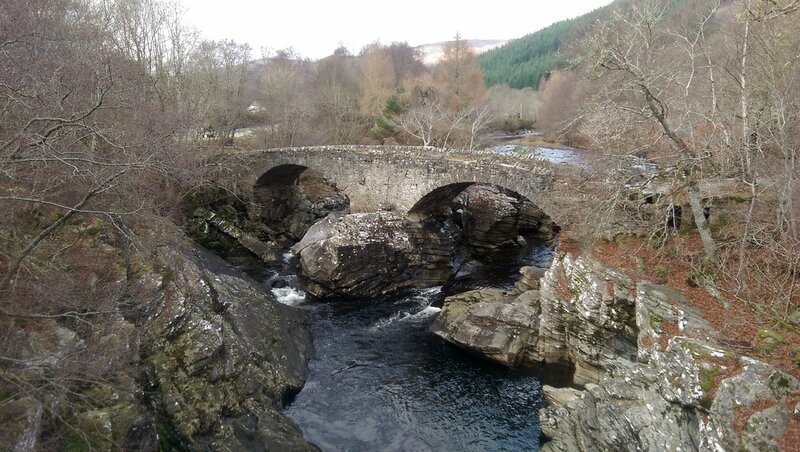 I had a 100 mile or 2.5 hour drive home, but it was a fine day so I made a few stops along the way; Pea and ham soup/sandwich in Spean Bridge, The Commando Memorial (always worth stopping at on a fine day such as this) and finally, a look at the waterfalls and old bridge at Invermoriston. I did make one further stop - Highland Bikes in Inverness. I look forward to collecting my bike with fully working brakes!